Solar creates jobs. Lots of them. Solar employs hundreds of thousands of Americans. Behind every solar array—from the small rooftop system to the larger utility-scale solar farm—lies a team of engineers, electricians, equipment manufacturers, system designers, salespeople, and field installers. As solar grows, so too does solar employment. Solar now employs more than 250,000 Americans full time across all 50 states. By going solar at your home or business, you’re helping to expand solar employment! Solar now employs more than 250,000 Americans in all 50 states. The number of solar jobs in the U.S. has grown rapidly in the past decade. Thanks to falling equipment costs and increased consumer demand, solar deployment and solar jobs have multiplied. Between 2012 and 2017, the solar industry added over 130,000 new jobs across the country—accounting for one in every 100 new jobs nation-wide. For employees across the energy industry, solar is the best and brightest place to be. As of 2016, solar employed twice as many workers as coal and nearly five times as many as nuclear. And now that solar is the fastest growing source of power in the country, employment is set to rise steadily in the coming years. What comes to mind when you picture a solar job? Someone on a roof installing solar panels? Perhaps someone on a manufacturing line producing the panels? While installer and manufacturer remain two of the leading solar jobs, the solar industry features more than 40 different career paths. Solar jobs span multiple sectors—from manufacturing to engineering to design to sales to policy—presenting ample opportunities for both skilled and unskilled workers. What’s more, military skills translate particularly well to the solar industry and solar employers across the country are looking to bring veterans onto their staff. Solar jobs are here, they’re growing, and they’re diverse. Hundreds of thousands of Americans are already employed by the solar industry. But what about solar jobs in your backyard? For a deeper dive into solar job creation in your community, check out The Solar Foundation’s Solar Job Census 2018. The map displays solar job figures on a state-by-state and county-by-county level. See how many solar jobs are in your local community! The Solar Foundation has compiled a comprehensive census of the number of solar jobs throughout the country in 2018. 2018 Solar Jobs Census – Produced by The Solar Foundation, the Jobs Census is the preeminent solar jobs tracker. The Jobs Census gets updated on an annual basis. Click here to view data for each state. The residential side of the sector is responsible for more jobs than any other part solar industry, representing more than a third of all solar industry jobs nation-wide. Residential solar employs four times as many workers as utility scale solar. 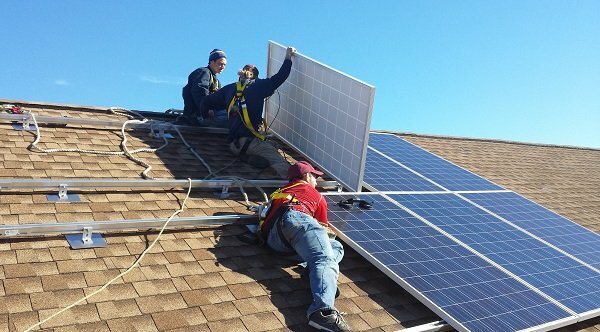 GRID Alternatives – GRID Alternatives is a national nonprofit organization that uses volunteer labor to install solar systems on low-income houses. Grid trains their volunteers on how to install and wire a solar system. If you’re looking for hands-on experience with the solar installation, GRID is a great organization to volunteer with. NABCEP – The North American Board of Certified Energy Practitioners is the nation’s leading certification program for solar professionals. They offer six different solar job certifications. Most installation companies seek to have at least one NABCEP-certified employee on staff, so pursuing your own NABCEP certification can help advance your solar career. Solar Energy International – SEI is a leading education program for individuals looking to start (or deepen) their career in solar. They offer multiple online courses and hands-on workshops related to solar installation and system design. Solar Holler – Solar Holler is a West Virginia-based solar installation company that employs re-trained coal miners. Their practice is a leading model for how to maximize solar’s job creation potential in traditional energy economies. Solar Ready Vets – This Department of Energy program (administered by The Solar Foundation) seeks to “connect transitioning military personnel with solar training and employment opportunities.” Through the program, solar training initiatives were established at 10 military bases across the country. While not actively funded anymore, the program is still continuing at most of the original bases. 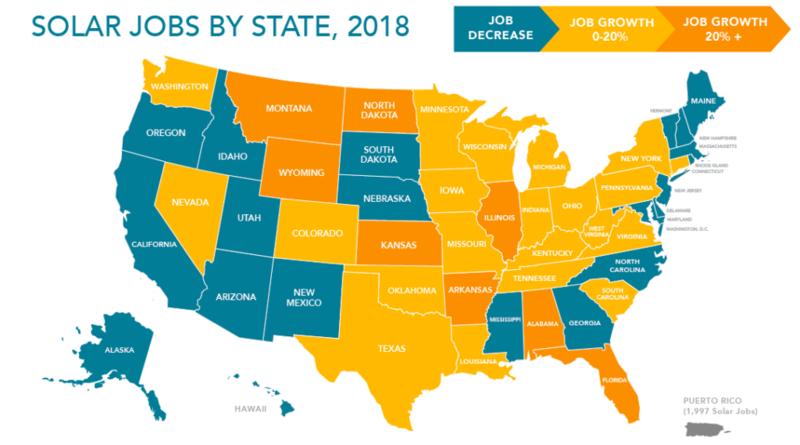 The Fastest-Growing Jobs in Each State – A new report using Bureau of Labor Statistics data finds that solar installer is the fastest growing job in eight states. 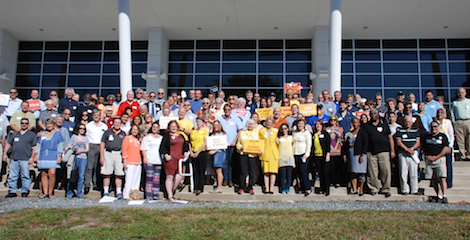 Solar United Neighbors helps real people go solar by organizing local solar co-ops. Our solar co-ops are groups of neighbors and community members who come together to go solar on their homes and businesses with the technical support of Solar United Neighbors. To date, our solar co-ops have taken more than 2,500 individuals solar. Along with the resulting electric bill savings, local wealth creation, and public health benefits, these 2,500 installations have created lots and lots of solar jobs. 570 jobs, to be exact! Using the National Renewable Energy Laboratory’s Jobs and Economic Development (JEDI) model, we’re able to quantify the number of jobs created from the solar installations that result from our solar co-ops. So, thanks to the more than 2,500 households and businesses that have gone solar through our solar co-ops, 570 new solar jobs have been created across our 9 states. These solar jobs aren’t just numbers and statistics. They are community members, real people, and real lives. For example, Solar United Neighbors of West Virginia has had the pleasure of working with Doyle Tenney on multiple solar co-ops. 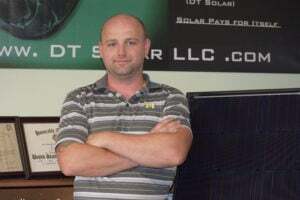 Doyle created DT Solar (his own solar company) after seeing the demand for solar installations caused by our solar co-ops. 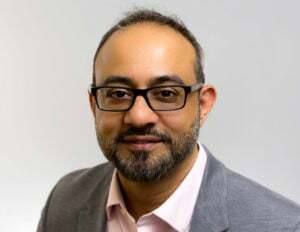 According to Doyle, “I believe [Solar United Neighbors of West Virginia] plays a vital role in the growth of the solar industry in West Virginia. Their success is a success for my business, many other solar businesses, and the thousands of works who are unemployed in the state.” Across the border, Solar United Neighbors of Ohio has worked with Cleveland-based installer YellowLite on the Cuyahoga County Solar Co-op. Thanks to the demand from hundreds of homeowners across the County, YellowLite was able to grow their installation business while serving the Co-op. In Florida, one of the nation’s fastest-growing solar markets, our solar co-ops have helped nearly 1,000 Florida homeowners go solar. 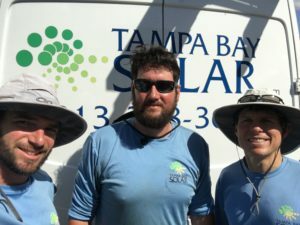 Solar United Neighbors of Florida has had the pleasure of working with dozens of solar installers across the state to provide quality installations to our co-op participants. For the Hillsborough and Citrus County Solar Co-ops, Solar United Neighbors partnered with Tampa Bay Solar. Owner Steve Rutherford, a veteran and former Navy SEAL, has been an outspoken supporter of solar’s job creation potential. Steve Rutherford, Tampa Bay Solar. Are you a solar installation company looking for more information about working with Solar United Neighbors? Visit our For Installers page. Every $1 contributed to Solar United Neighbors produces $44 in local benefits. See how we put your dollars to work to make an impact on the solar market! "Solar United Neighbors has been a valuable partner in not only the growth of solar here in Ohio, but also for our company."